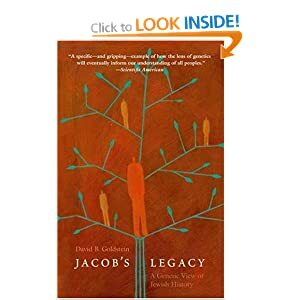 I'm currently reading "Jacob's Legacy: A Genetic View of Jewish History" by David Goldstein on my Kindle (it makes it far too easy to buy books - I need to find some way to control myself!). I've always been fascinated by genetics (obviously) and by the Old Testament and the history of the Jewish people. In this accessible and fascinating book David Goldstein (something of a legend among population geneticists) uses the techniques of his field to see what the genetic makeup of today's Jewish people tell us about the events that shaped this amazing group. Particularly impressive is the work on the Y chromosome that demonstrates that the line of the Cohanim (the paternal priestly line going back to the legendary Aaron) really does seem to be different from that in "ordinary" Jews (where the maternal lineage is the main determinant). I'm only part of the way through at present, but it's a gripping read, and acts as something of a taster to the wonders that may await us as genetic technology progresses, and we can start mapping the origins of many many more genetic variants. When we look at a family tree, we often only focus on one line, yet if you go back just ten generations, there are potentially over a thousand people contributing to your genetic heritage! Go back twenty generations, and it's a million. Thirty generations (that's getting to about 750 years), a billon. Now of course that's more people than would have been on the planet back then; what is going on of course is that there is not full outbreeding - the lines of descent cross frequently, so although a couple might not know they are related, it may be that only a few generations back they share a common ancestor. I did get a bit of a shock when I found that happening in my own family (OK, back to the 1700s, but that was only 8 generations! And even then, that's only along one line that I know about). Genetics allows us to unpick these relationships - especially when you think that if 1000 years is only about 40 generations, and the entire sweep of Jewish history is only 120 generations at the very most, we really should have the resolution to address some very specific questions. That is what David Goldstein has done with several Jewish populations over the world, and although I haven't finished the book yet, I would strongly recommend it. I've now finished the book - it's quite short and very readable. This is a Good Thing in my estimation - too many books (and blog posts?) pad themselves out with unnecessary verbosity. After dealing with the Y chromosome inheritance of the Cohanim and the Levites (again showing a signal suggestive of a restricted pool of progenitors, including the Cohanim Modal Haplotype - CMH - the variant of the Y chromosome seen at a much higher level in Cohanim), David looks at the ladies - what about mitochondrial DNA? In Jewish societies, "Jewishness" is often considered to be *matrilineal* in inheritance, i.e. like mitochondria, you inherit it from your mother. In various scattered Jewish communities he again finds evidence of a mitochondrial "bottleneck", and speculates that this might be due to males founding the communities in their travels, with local lassies for brides, but once the community became established, matrilineality kicked in. There are interpretative difficulties with all this, and I would have liked more in-depth discussion as to how these are resolved, but that perhaps puts things into a more esoteric level that might put off the casual non-geneticist reader. Then there is the burden of genetic disease supposedly afflicting the Ashkenazim in particular. I have to say I am never that impressed by the incidence levels of genetic disease in the Ashkenazi - they are not *that* spectacularly more likely to have genetic diseases than many other populations, and although certain disorders are carried at a slightly higher frequency than we see elsewhere (e.g. Tay Sachs disease), it's far from clear (to me anyway) that this represents anything other than founder effect and ascertainment bias. This is an ongoing debate - I think I prefer the sidelines! What of the future? Well, mitochondria and Y chromosomes really only give a partial picture, and they are susceptible to all sorts of confounding effects. The autosomal DNA (the main part that is inherited the same whether you are male or female) is trickier to follow and interpret, but as DNA sequencing gets cheaper (it's falling by a factor of TEN every two years or so, which is incredible, although that's levelling off a bit now), more sequence data becomes available, and the resolution with which we can look at genetic factors in populations improves. Techniques may well become available for pinpointing the origin of genes much more precisely, and we may be able to integrate this information with other sources, such as the Y and mitochondrial work, as well as archaeological and historical data. A further tantalising prospect is the ability to perform whole genome analysis on ancient samples, such as has been recently reported for the Denisovans by Svante Paabo and colleagues at the Max Planck. Things are set to become very interesting - not just for the Children of Israel, but everyone interested in our origins. Each of those genetic sequences has come down through a series of real people - it would be wonderful to be able to tell their personal stories as well as the stories of their genes. The big question, to my mind, is - what is it like to read books on a kindle? and just how tempting is it to buy books? Do you end up with scores that you'll never get round to reading? Hi Graham, I think the key is to be disciplined. But it is very very easy to buy books, and that can be a bit dangerous! The screen is very good indeed - I think it could be perhaps a *tad* better - still a shade too grey. It could do with being whiter. Also the screen, although matte-ish, still reflects a little too much light, so if you are reading it under a spot light (for instance, as I do when I'm shaving) you need to adjust the angle a bit. Some books come with their own fonts which don't render as well as the inbuilt ones - they render very sweetly indeed - you need to look really close to see any evidence of pixellation. Actually, I do have one criticism of the Kindle version of Jacob's Legacy - the footnotes are not hyperlinked from the reference superscripts on the pages, so you need to jump back and forth. I think this is a publisher thing, rather than a Kindle problem. I suspect other books may run into the same difficulties. I would definitely recommend downloading a pile of the classics from Project Gutenberg - that'll keep you reading for yonks. I'm loving my Kindle. No complaints about the screen at all and the browser is fun - it's how the internet would have been if it was invented in 1863. 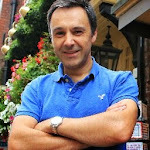 The problem with overspending is easily solved, as you say Helio, with Project Gutenberg and - even better - archive.org. A million free books, if you please. Should tide me over until they roll out the lending thing worldwide. J'ai commandé une montre Rolex Replica ici. La montre rolex que j'ai reçue était une maçonnerie parfaite et éblouissante. Très satisfait de l'achat.